The warning is in effect for minor flooding in low lying and flood prone areas and is valid until 5 pm today. (2016 FILE PHOTO) DMCA photos of the lahar in the Belham Valley from overnight rain fall. Therefore, the Disaster Management Coordination Agency (DMCA) is advising motorists to drive with due care and attention and be mindful of areas prone to flooding. The areas are from Robert W Griffith Drive to Carrs Bay – adjacent to Piper’s Pond and Pump Ghaut in St John’s. 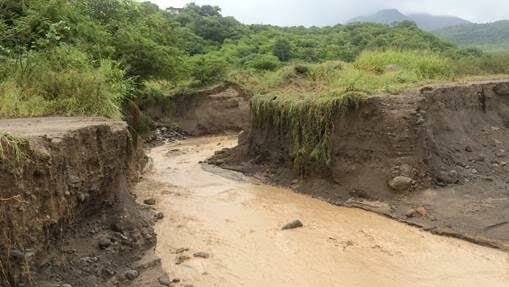 The DMCA is also cautioning motorists especially when driving to remain alert and look out for areas prone to landslides and rockfalls namely from Forgathy to Cudjoe Head, Pump Ghaut to Look Out and the Barzeys area.